WASHINGTON, D.C. -- Despite record-low temperatures in many parts of the country in February, the 51% of Americans who say temperatures in their local area have been colder than usual this winter is down from the 66% who said this about last winter. Eighteen percent of Americans say this winter has been warmer than usual, and 29% say it has been about the same as past winters. 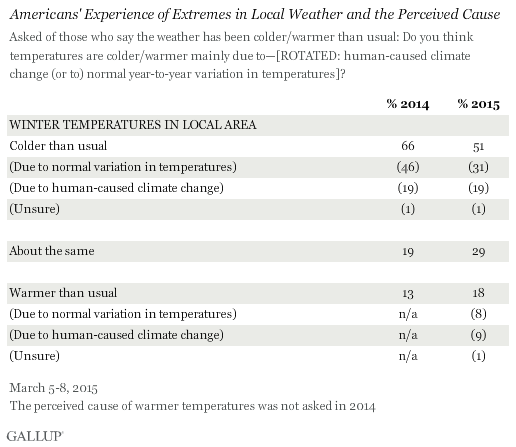 Gallup's March 5-8 Environment poll asked Americans to report on weather conditions in their local areas. Record snowfall covered much of the northeastern U.S. this winter, and at least eight northeastern cities reported record-cold temperatures in February. However, January 2015 was warmer in the Northeast, on average, than January 2014. And cities in the South were as cold in January 2014 as in 2015. The Western U.S. also had far less snow than usual in 2015 -- states such as California and Oregon have experienced snow droughts, and warm weather has quickly melted the snow they did receive. How Americans in different regions view their local weather mimics these regional variations. 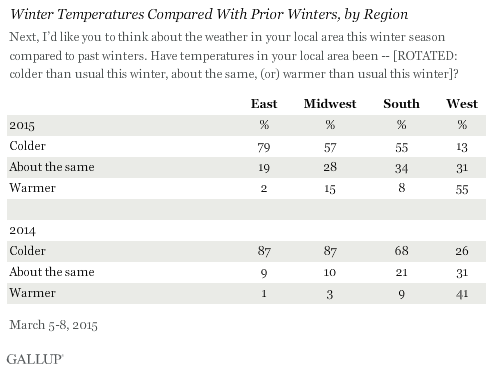 More than three in four Easterners (79%) say their winter has been colder than usual. 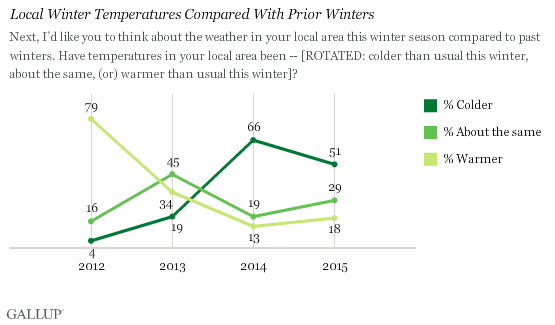 Meanwhile, more than half of Westerners (55%) say their winter has been warmer than usual. A slight majority of Americans living in the South and Midwest say their winters have been colder than usual. This year, fewer residents in all four regions say their winters are colder than normal than said so last year. This includes a 30-percentage-point drop in Midwesterners who report colder-than-usual temperatures, from 87% in 2014 to 57% this year, and 13-point drops in the South and West. In 2014, much of the Midwest had extreme cold temperatures, including Chicago with the fourth-most days on record with temperatures at or below zero degrees. Westerners and those in the Midwest are more likely to say in 2015 that their winter has been warmer than usual than the percentage who said the same in 2014. NASA satellites confirm that the western third of the U.S. have had a warmer-than-normal winter so far in 2015. Because the topic of climate change tends to come up when extreme weather patterns occur, Gallup asked Americans this year and last year whether they believe that climate change is behind the unusual temperatures they said they are experiencing. Americans who say this winter's temperatures are colder than usual are less inclined to believe climate change is the cause and are more likely to ascribe them to normal temperature variations. Slightly less than a third of Americans (31%) attribute their reported colder-than-usual winter to normal temperature variations, while 19% say that their local weather is colder than usual because of human-caused climate change. In contrast, Americans who say this winter's temperatures are warmer than usual are divided on the cause: Nine percent of Americans who say that their winter has been warmer than usual attribute it to climate change, and 8% say the warmer winter they are experiencing is because of normal variation. In 2014, more Americans experiencing colder temperatures attributed them to normal variation rather than to climate change. Despite record-cold February temperatures in many areas of the country, Americans are less likely to say this winter has been colder than usual than said so last winter. Americans who say that this winter has been colder than usual are likely to blame normal variations in temperatures, similar to sentiments about last year's winter. But the smaller number of Americans who say this winter has been warmer than usual are divided as to whether it is because of normal variations or because of human-caused climate change. The U.S. Environmental Protection Agency warns that climate change is making temperature extremes more common; however, more extreme high temperatures have been observed than extreme low temperatures. Furthermore, the EPA warns that climate change can cause more precipitation, like snow, in big, single-day storms. However, the EPA also makes a distinction between long-term climate change and short-term regional weather changes or events. Discussions about the cause of winter weather changes are likely to continue, as it may be hard for Americans to put year-over-year changes into a longer-term context. Global Warming or Climate Change: Is There a Difference? In a guest commentary for Gallup, Riley Dunlap, Regents Professor of Sociology at Oklahoma State University, explores differences in Americans' views when they hear the terms "climate change" and "global warming." Many more Americans who say their area is experiencing colder winter temperatures or drought attribute these events to normal yearly weather variations rather than climate change. Most Americans, 65%, believe global warming is currently happening or will happen in their lifetimes, but far fewer, 36%, predict it will be a serious threat to their way of life.